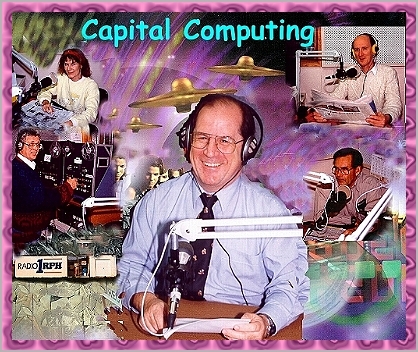 Capital Computing is a thirty minute news program which was broadcast every Thursday on Radio 1RPH in Canberra - 1125 KHz on the AM band. The first program was broadcast on 18 April 1996 and the last program went to air on 28 May 1998. It was produced by volunteers from the PC Users Group of the ACT and featured news and views on the world of personal computing and communications. This website will be maintained for archival interest until July 1998 and will then be removed. The picture on the right shows Mike Gellard, the program anchor in the centre, with Brian Williamson operating the reel-to-reel on Mike's left. Honey Nelson is sitting above Brian, Chris Arndt on the top right and Terry Bibo on the right hand side below Chris. Archival material about Capital Computing and some information about Radio 1RPH.